Our recycled mats, including our Maori and Pacific Island mats and large childcare play mats, have been made to the best attainable standards from UV treated recycled Polypropylene. This gives them excellent protection from sun damage, but we do not recommend leaving them in continuous direct sunlight or moisture. They are also mould-resistant, non-toxic, hypo-allergenic, lightweight and reversible, making them extremely practical for daily use in any environment! Your recycled mats will arrive folded for ease of transport. When you receive your play mat, it will have fold marks. These folds will drop out over time; normally it takes a few weeks, but high temperatures may speed up the process. The plastic has a short ‘memory’ of being folded so to help it ‘forget’ the fold line, simply pop your mat out in the sun for a few days. Hang you mat over your washing line, for example. Keep in mind that a short time in the sun is not harmful, but day in/day out sun will affect the longevity of your mat. Of course, if you fold your mat up at the end of each day, such as in a classroom, the fold lines will remain. When it comes to cleaning, your plastic Polypropylene indoor/outdoor mats can be shaken off or vacuumed for dust and dirt. For heavier soiling, take your mat outside and rinse with a hose. We do not recommend abrasive or chemical cleaning products. If food or dirt is wedged into the woven fabric of the mats, use warm water and a soft broom to lightly scrub the dirt out. Allow the play mat to dry on a fence or washing line. We do not recommend using a water blaster or intense pressure water cleaner as the mat fibres can blow apart under pressure. Our ethical, recycled mats are sturdy and hard-wearing but, like any floor covering, they can get damaged by rough daily use. We suggest that you do not keep heavy items on your play mats, especially when in storage, as this may leave permanent dents in the mats. If using your indoor/outdoor mat beneath a table setting, ensure that the feet of the chairs and tables are larger than the size of a 5 cent piece. This helps distribute weight more evenly, and stops the feet getting caught in the woven fabric. To store your indoor/outdoor mats when not in use, we suggest that you roll up smaller mats and fold larger mats along the seams. Our recycled mats are easily stored in cupboards or the back of the car, preferably out of direct sunlight to avoid deterioration. If your mat is getting extensive daily use, the seams can begin to pull apart over a period of time. It is possible to re-stitch these back together using a strong cotton or fishing twine and a large needle. If using your plastic mats on a wood or tile floor we suggest that you anchor the corners down with the edge of a couch or desk, or use a non-skid floor protector under the mat to keep it in place. The Otentik Sunshade’s user friendly design employs sandbags instead of pegs and can be used on any terrain for upto 4 or 6 people. This is a must have product for all beach and outdoor lovers. How many people can the sunshade accommodate? The original sunshade is basically designed to accommodate up to 4 people. However, it also depends on your comfort, the set up and the sun’s direction. We have two sizes – the original plus large for upto 6 people. Is the sunshade windproof as well? Yes! The shade works even better when the wind inflates the underside of the shade, thus producing a much large surface area facing the sun. So how to do this? 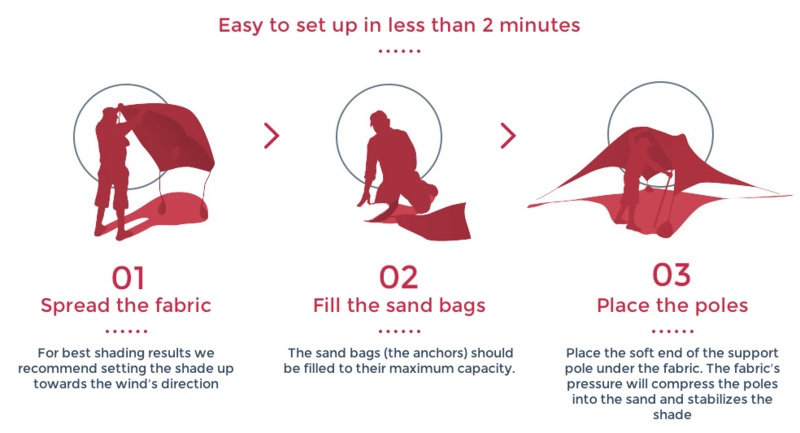 First, make sure that you fill the sandbags to the max and then stretch the sunshade before you place the support poles – this is very important! Then place only one pole, and place it into the wind direction. Move the pole until the sunshade stabilize and then place the second pole. Make sure the fabric is properly stretched out and the sand bags full with sand and cannot move. Also make sure the pole is properly placed and balanced. When the sun moves, do I have to take it down and then set it up again? No need for that. You simply move a pole or both and redesign the shade, for it to once again protect you from the sun. The pole’s spring is loose, what should I do? Occasionally when the sunshade is brought down, you might have pulled a little too hard so the spring came loose. No worries, all you need is to put it back in place. Does Otentik meet with the Australian and New Zealand standards for sun protection? Absolutely! Otentik meets with the AZ/NZS 4399:1996 standard which is the Australian and New Zealand standard for sun protection. The fabric the sunshade is made of is the same fabric used in bathing and swimming suits as well as sportswear. It is therefore the perfect material for our product. In addition to UPF50 sun protection it is also sand-repellent, strong, light weight, chlorine and saltwater resistant. Does the sunshade provide full protection from the sun? From direct sun radiation yes! However, on a beach or a cloudy day the sun’s rays and UV will scatter and reflect into the sunshade. We always recommend the essential of Slip Slop Slap so please be safe and stay protected from the sun using other means. Our shade is merely another precaution to protect you from the sun. Do I need to clean the sunshade from sand at the end of the day? Actually, the material we use is sand resistant, not to mention chlorine and salt resistant. Hence all that is needed is a shake out of the tent to get rid of all the sand. The sunshade was invented by Otentik, an Israeli company and is manufactured in Europe. The TreePod Cabana or Lounger has been designed to be set up with ease. After the second time doing the set up it will become second nature. Every TreePod Cabana or Lounge includes your chosen pod, rope, quick link, hand strap and frame all in a convenient carry bag. How big is the TreePod Cabana & Lounger when packed down? The TreePod Cabana or Lounger is not much bigger that a 2 person tent when packed in its carry bag and depending in which version you have weighs upto 11.5kgs. How many people can fit in a TreePod? The TreePod Cabana & Lounger range can hold as many people as you feel comfortable, however is limited to a total combined weight of 226kgs (500lbs). Are accessories available for the TreePod range? As the TreePod Cabana & Lounger range were only officially launched in early 2018 the accessory range was originally limited. We stock all of the available accessories which include bug doors, rain flys, additional storage bags & covers etc. We will also stock other accessories as they become available, so please keep an eye out for the range here. Why is the TreePod Tripod Stand sent through a freight company & not a courier? The TreePod Tripod Stand weighs approximately 28kgs when packed down. This weight is too heavy for a courier to take and it is more cost effective to send via a freight company. How much will it cost to send the TreePod Tripod Stand through a freight company? As the TreePod Tripod Stand weighs approximately 30kgs we need your delivery details to provide a specific price. You may be given the choice of collecting from a local depot to make it more cost effective, or you may have to pay for it to be delivered to your door. A signature will need to be obtained for collection from a local depot and/or delivery to your door. All details will be provided at the time of quoting. The TreePod range was invented by TreePod Hanging Habitats, a US company and is manufactured in China. The TreePods are manufactured by one of China’s leading tent makers and undergo a rigorous quality control post manufacturing & prior to being sent. Can the TreePod be used in a playground? We do not advise that the TreePod is used in a high traffic recreational environment, such as a playground. The TreePod is ideally suited in a controlled/monitored situation to create a relaxing environment and as a sensory swing. Can I become a retailer of the TreePod range? The TreePod Cabana & Lounger range is available exclusively in New Zealand through Lifestyle Gear. While our current stock is limited, we are expecting a new shipment to arrive in New Zealand by mid 2018 and are looking to appoint bricks & mortar retailers. If you are interested in becoming a retailer of the TreePod, please click here.